Flexible crash doors are a robust, adaptable and economic installation that Acorn Glass install in wall openings to enable you to reduce noise and heat loss between areas, have a minimum ongoing maintenance requirement and allow free and easy flow of vehicles and pedestrians through them. Typically Acorn Glass have installed flexible crash doors in a wide range of establishments that include warehouses, industrial units, factories, manufacturing/production areas including clean rooms and storage units. The crash doors come in a light to heavy duty operating use range with concealed spring mechanisms. A full repair service is also available from out team of experienced and skilled engineers. Out technical team at Acorn Glass are available to help you choose the most suitable configuration for your doors and their intended use in order to extend their lifespan. Where there are large openings and flexible crash doors are not an option Acorn Glass regularly supply and install flexible pvc strip curtains as an economical and effective solution to reducing heat loss, from a building a room, whilst maintaining the ability for free flow of vehicles and pedestrians. 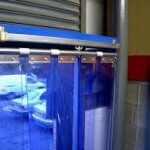 These strip curtains will also assist in the reduction of noise transfer, dust and fumes and employee safety. Quick to install and come complete with a range of track fittings that can be applied to almost any opening. They may be fitted on the face or to the soffit of an opening and, if required, behind roller shutter doors to enable property security not to be compromised. Additionally the curtains may be fitted with a full overlap, a partial overlap or no overlap. Speak to our technical team who will be able to assist you in choosing a curtain type to suit your requirements whether it is for an area where repeated and heavy impact occurs and a more durable curtain strip may be required, or a low use and impact area where a more light duty curtain will suffice. Special strips are also available for areas such as welding or refrigeration. Our crash doors are available with an extensive range of door viewing panels of a size and shape to suit your requirement; they may be half door, quarter door, small viewing panel or set midway between a top an upper and lower solid panel. 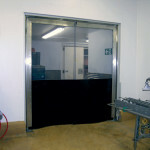 Strip curtains have been installed in common areas that include external loading bays to internal warehouse storage areas, spray booths and internally between manufacturing areas.